But adapting it to the Voltera may prove promising. I'm baking one side of a modified practice board to test my rings vs oval pads theory as to why my last board was such a spectacular fail when it came time to solder the header pins. Since I was trashing a 2x3" board anyway, I figured I'd add a bunch of vias of decreasing size. One of my errors on an earlier board was making the via too large. For my .030" eyelets, the magic diameter seems to be 0.0315". The eyelet goes in without forcing, but stays snug. If the hole is too large then you run the risk of the eyelet falling out when you flip the board, and the gap between the eyelet and ink ring is too large and soldering becomes problematic. That's an old 3/32" flat pin punch I had laying around, a dwindling packet of eyelets, and a pointy tool from Harbor Freight. I don't know where my straight one is hiding, but the right-angle tool turned out to be easier anyway. 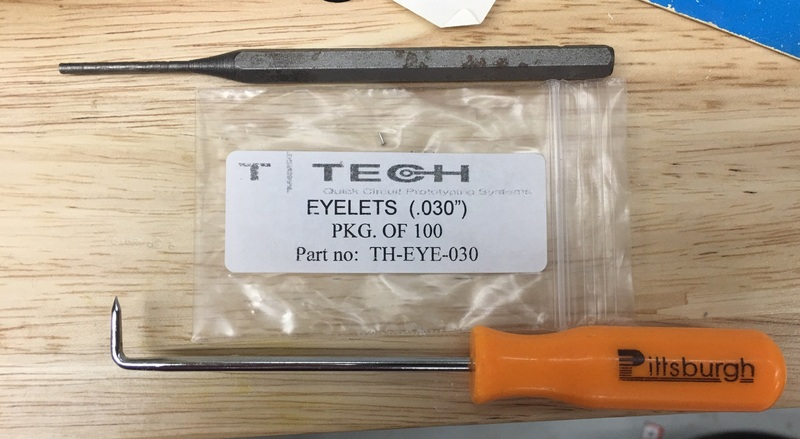 The MIT site gives suggested tools from McMaster, including a nail set which has a more aggressive taper on the tip, but what I had worked fine. The bottom right have the rivets. There's ink on them, though the leftmost one shows signs the nozzle was a bit low. The remainder of the pads are for my soldering test. 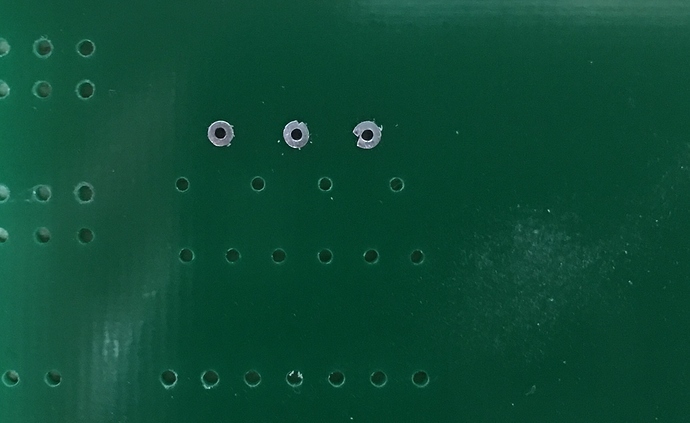 So in theory, this technique avoids the problem of hand-soldering (where one ruined pad trashes the board), as it relies on the ink to create the connectivity to the eyelet. Unfortunately I was in a rush so I didn't actually connect the vias, which would have given at least one data point as to how much risk there is of snagging the nozzle, whether the ink is continuous, etc. Next time. After this bakes I'll try to ascertain how good the bond is by burnishing and poking at the ink to see how fragile it is. So far so good. If this works it will be promising for both ink and milled boards. For ink boards especially, as it is much faster to rivet the vias than it is to futz around trying to solder both sides. You also are doing it during a phase which is very forgiving of error---after all, it's just an FR4 board with holes in it at this point. No components to damage, no large time investment wasted if things go awry, etc. 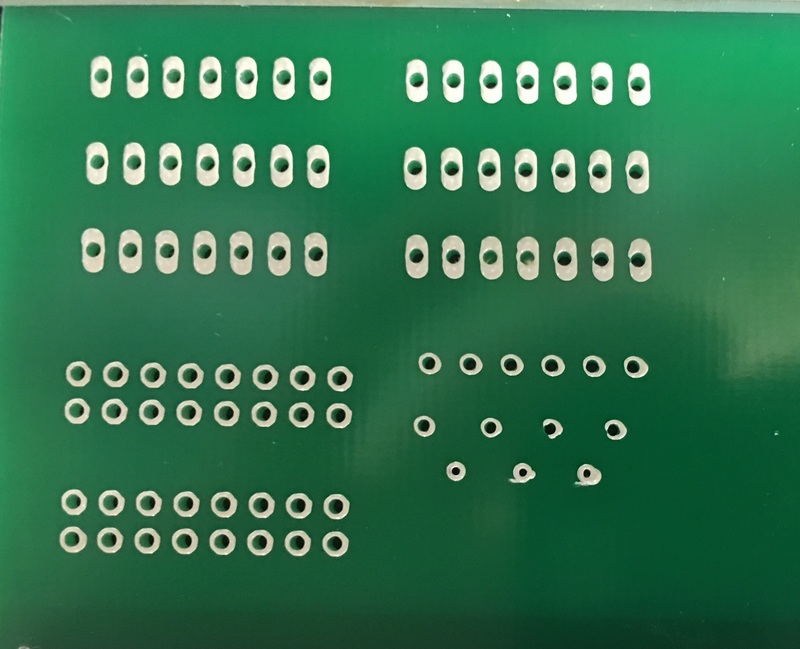 With milled boards you don't have the ink so you'd likely want to manually dot the top side with paste before reflow, then use your favorite rework method to solder the bottom side. Another thought: having used the eyelets before, they make a great quick-and-dirty way to provide plating for through-holes intended for components in addition to vias. The ones I use are a little narrow, so things like header pins probably won't work. But machined pins do, as to PDIP leads, wires from passive components such as resistors, caps, etc. It saves having to solder top and bottom, which is either one more thing to go wrong at worst, and more time and hassle at best. I have the same eyelets that you do. Right now I mill my boards with my OtherMill and then pop in the eyelets. I had thought of getting eyelets with a larger inner diameter for through hole components like headers. Print and bake the traces BEFORE the holes are drilled. This way the trace would cover the hole. Could even create a mini pad. 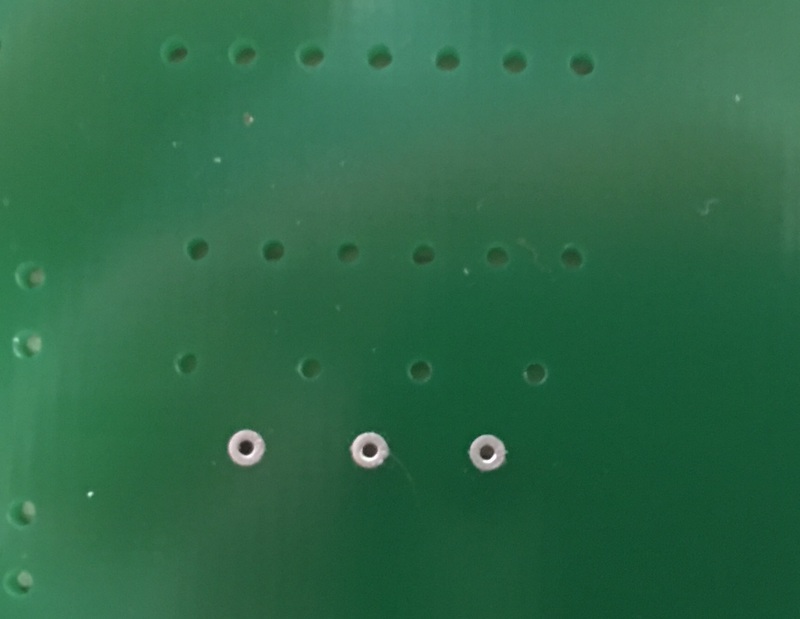 Drill the holes and install the eyelets so they connect with the traces better. Put a bit of solder paste on them to bind it all together. Can you post the link to the MIT article that you reference? I'd like to see what tools they recommend from McMaster-Carr. This is awesome!! The current recommendation of filling vias with ink is a bit finicky for my liking as well, so a simpler process would be great. This one uses 0.4mm ID / 0.6mm OD rivets that were used in their project, and the recommended center punch from Mcmaster as well. I found that the hole should be 0.05 - 0.1mm larger than the OD of the rivet for a snug fit, which lines up pretty well with your results! Have you tried the ink-filling method for vias, and if so, how does your experience compare? Personally I find rivets to be a much smoother process, and the benefit of plated through holes is a huge bonus. 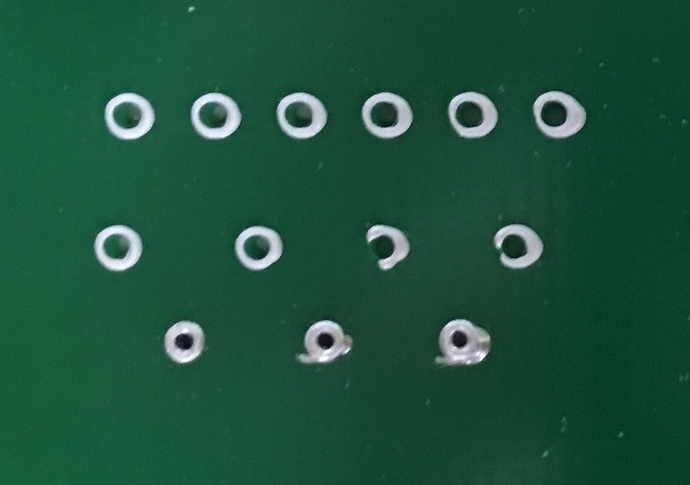 The rivets I got were they're pretty inexpensive at about $0.06 ea from a US Distributor, but the downside is you need to buy in quantities of 1000 per size... I'm following up with the rivet manufacturer in Germany to see about bulk pricing, so we can down-pack into more reasonable quantities. If there's a consensus on the topic, and you have some suggestions about reasonable quantities for a rivet kit, we can look into putting them up on the Voltera store! Looks like the eyelet placement after the tracing looks really good. and you don't need the solder paste to bind them together after all (which would prevent bending nozzles). This really looks like the way to go. I also hear that Voltera might be adding a drill tool to make doing the eyelets that much easier. And as long as the holes provide a snug fit without having to put too much pressure to get them inserted, I can't wait for my unit to arrive. I also ordered a couple packs of eyelets from the same manufacture that you did. They were just a bit to large for the standard eagle default for via's so I ended up bending a few when I inserted them (they were really fragile). However, they were much cheaper that the original ones I tried (here). 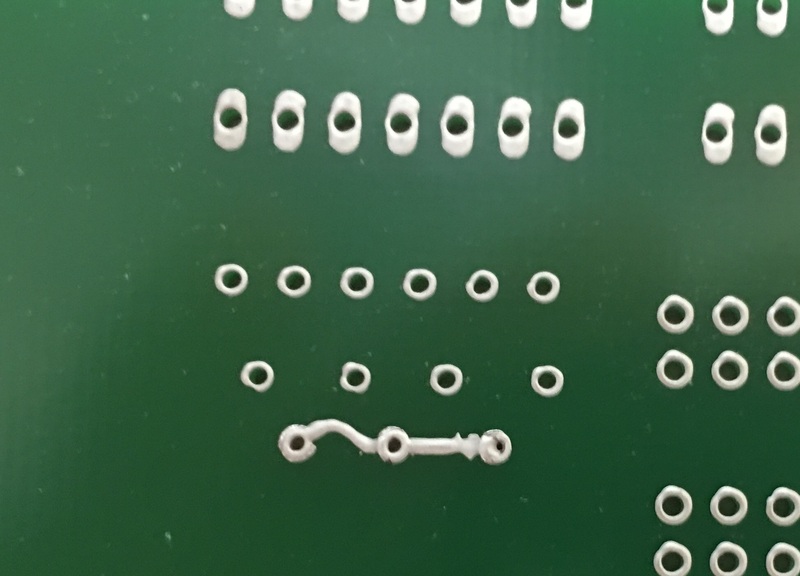 They say these are "solder plated" but not sure about that. Never tried putting an iron or hot air to them. I went back to Eagle and added a couple of lines to make traces between the vias, and it all just worked fine. The ink adhered to the board and rivets very well. The only hiccup (and you can see this in the right most rivet) is that if the nozzle starts on the rivet and goes out, there is a break in the ink flow. If the nozzle starts on the trace and ends on the rivet, it joins perfectly. I had to use tweezers to smear a little ink from the rivet over to the trace to make this particular experiment work. Seems like that could be handled in the software when it creates the toolpath, and perhaps an option to give a little more Z clearance on vias for those who put rivets in before inking, just to make sure the nozzle doesn't snag. Or an option for extra Z-probing around vias. 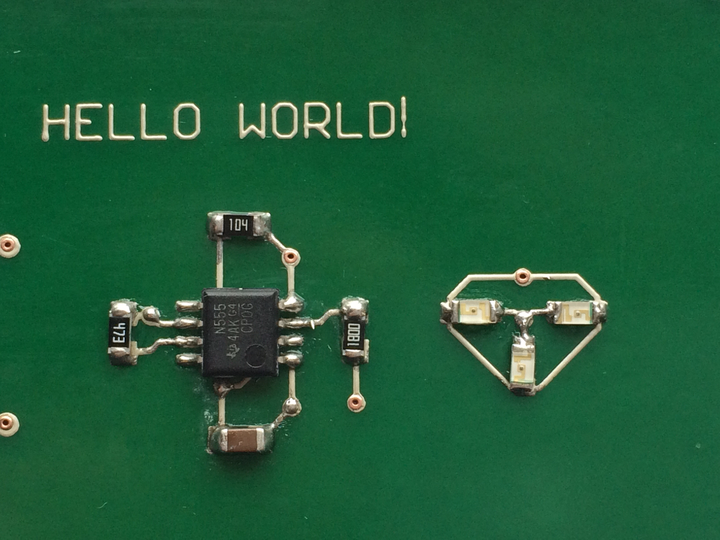 @RoySalisbury the "PCB Rivets" is a link, you should be able to click on it. The OtherMill's ability to align with existing features on a board is more limited than the Voltera. I don't know what you would align to on the Voltera. A pre-drilled board is easy---just align to the holes. The first part in particular is vexing. I find it tricky even when simply doing double-sided boards---it's a good day when the via holes on the flip side center exactly on the pads. Usually it's slightly off-center. There's no alignment procedure for the OtherMill that I'm aware of that operates similarly to the Voltera. If I'm missing something, I'd be glad to hear about it. @mewertow Nice work! Spooky that we all had the same thoughts around the same time. For me, my old workflow just wasn't working anymore and I had to figure out something better. First and foremost: no soldering at all. The ink does all the work: holds the rivet in place and provides the electrical connection. Once ink is on the board, that side is no longer perfectly flat, which makes it harder to ensure tension on the rivet. I'd be worried about potentially damaging the ink from tapping the rivets flat. Especially if you've drilled through the ink, where I've found the interior of the ink can be a little more brittle than the surface. I suppose there's no wrong way, and users could pick what is more comfortable to them. Though I do think the rivets-first workflow has sufficient merit to account for it in the software (see my previous post about Z height and toolpath). Again, give it a try and see what you think. Having a kit in the store would be fabulous. It would be oddly low-tech compared to everything else (especially the part about "now grab a hammer...") But certainly less-expensive rivets would be nice. I had lots of cases where the continuity of the via failed (ink in the hole didn't fully cure, not enough ink to fill the hole and make contact with the pad, etc). And it only takes one of those to ruin a board. So yeah, I had given up on that awhile ago and have been using basic eyelets, soldering both sides and not riveting them. @DavidYon47 You are correct about getting the OtherMill aligned to the traces. Its not always perfect. The OtherPlan software needs a much better alignment process. As long as the I don't bend/break a nozzle then drilling first would be fine. But I think eyelets AFTER printing might fill in the holes a bit that you might need to clean up. Guess it depends on the board and the traces. Since I don't yet have the Voltera, all this is just speculation on my part. You guys have actual hands on experience. @RoySalisbury for what it's worth, I've had the best luck with drilling first then aligning the Voltera to the holes. I've only run into a single case where the hole was a liability, and that was in Z-probing, before the nozzle came into play. Otherwise, it's the most efficient workflow from what I can see. In my experiment there was no issue with ink bleeding into the hole of the eyelet. At the very least, I don't think you'd run into it any more often than you do with ink rings around bare holes. And if there is ink straddling the edge of a bare via, that can cause a problem when the hole is perfectly sized, as it will block the eyelet from entering. Spooky that we all had the same thoughts around the same time. As for aligning to features, generally if I have a blank board and I need to align both sides, I'll just use the fiducials on the substrates. If you design with EAGLE, you can grab the Voltera Community Library here - just drop the 2x3" or 4x3" substrate into your design and you're good to go.